The enumeration of emigrants from Irish Ports did not start until 1st May 1851. From that time onward to 1906, we have a list of the numbers leaving the country, unfortunately neither their names, the ports they left from nor their destinations have been included. 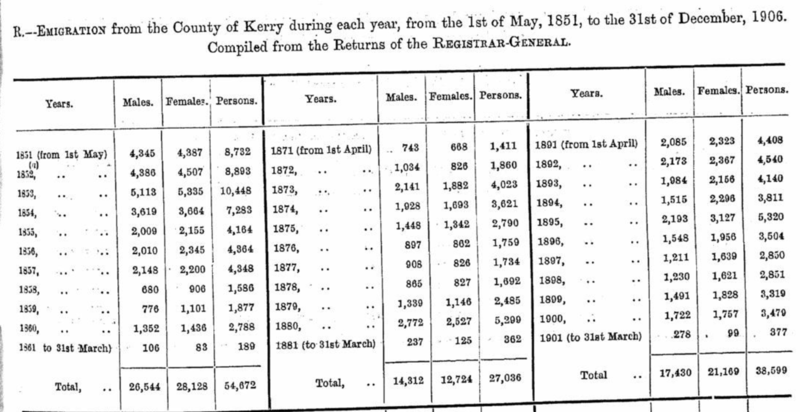 The figures below show that 113,237 males and 113,827 females, giving a total of 227,064 people emigrated from County Kerry during this period. These figures do not of course include those who emigrated to England/Scotland/Wales as we Irish were then regarded as citizens of the United Kingdom, the ‘great’ British Empire and leaving Kerry to work and/or live across the Irish sea was not regarded at the time as ’emigration’. Hello Kay, Still searching for McCarthy/Brennan family who emigrated 1847-1865 to Montreal. Think this list would not include Canada either as it was part of the British Empire at that time. Paul, if you would like to email me the name of your Savage ancestor who first immigrated, I can give a quick luck to see if we can locate him. I have just finished research for a client with an Elizabeth Savage, Tralee ancestor. There is no ‘Benjamin’ Savage recorded. PS: One trail led me to records in Tralee for Dobbins and to a prior Irish King who has exact coloring of me and my other brother. Red Haired King. Felt I was on the right trail here. A painting was done of this King. I will have to find the names on that one again in order to let you know any details. Martha Mattie Brown’s mother is supposed to be Esther Jones B 1805. Also Irish Pedigrees II, indicates that Brown was a large family in Kerry. Haven’t found a connection yet. Researching Richard O’Leary & Ann Dumas marriage in Bouleenshere in 1826 & Richard O’Leary & Bridget Sullivan of Newtown circa 1836. Found the records at St. John the Baptist Church in Causeway recording two Richards, one under the other & need to verify if the Richards recorded are the same person, or two different people. Where would I look to find the death record(s) of one or the other? Don, there are no death records available or recorded until after 1864 when compulsory Civil Registration became law. If you would like to email me directly caballkay@gmail.com with the details you have of Richard O’Leary & Ann Dumas, and also the Richard O’Leary/ Bridget Sullivan, which I cannnot locate. What parish were the latter married in? I can have a look at this for you. I’ve done quite a bit of research and can’t find anything about Kate Moriarty and Maurice Scanlon m.1879 in Ballyloughig after the 1901 census. They had 7 boys and a girl but the 1911 census has them scattered; and Maurice Scanlon waa a common name in the area. Their son James b.1898 was my grandfather and I have a copy of his passport and know he left in 1923 for Boston from Liverpool but nothing earlier. I am looking for information on my grandfather, Patrick Francis Hoar who was born in Annascaul, Kerry in January 1892, I believe. He had brothers,John, Mike, Tom all older than him and sisters Mary, Bridget,, Margaret. All but Margaret’ were older than him.